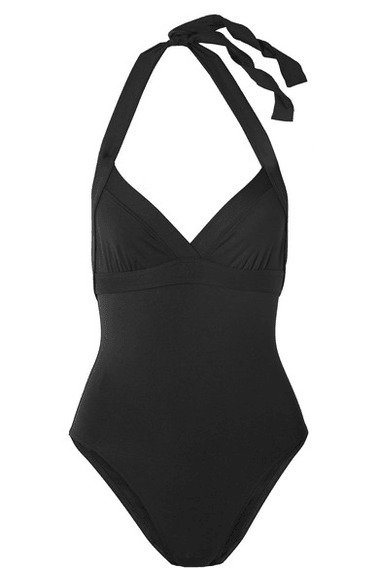 Eres demonstrates just how flattering swimsuits can be with this black 'Cassis' style from the label's 'Les Essentiels' collection. Made in France, it's cut from innovative peau douce fabric to smooth imperfections and has wide halterneck straps for added support. Wear it with: Alaïa Sunglasses. - Black stretch-polyamide - Ties at neck - 77% polyamide, 23% elastane - Machine wash - Lotion, sunscreen, oil and chlorine can cause discoloration of this item; this is not a manufacturing defect. Please follow care instructions to keep your swimwear in the best condition - Made in France Small to size. See Size & Fit notes.